We don’t see quantitative tightening (QT) as quantitative easing (QE) in reverse. Some market participants believe recent trouble spots, such as February’s VIX spike and Turkey more recently, are due to QT–G3 central banks shrinking their balance sheets, either actually (the Federal Reserve) or expected (the European Central Bank and Bank of Japan). This view holds that central banks’ earlier QE–an emergency policy response to help ease the severe shock to financial conditions during the worst of the 2008 financial crisis–flooded the market with liquidity, inflated asset values and artificially compressed market volatility. In a mirror image, QT’s drain of liquidity from the financial system should put pressure on risk assets. This narrative seems intuitive, yet we see reasons why the reality is more complicated. The performance of risk assets during the QE period was not driven by QE alone. Some risk assets had a bumpy ride during QE programs. The MSCI World has not enjoyed a one-way ride higher with G3 QE. Emerging market assets have been buffeted repeatedly during the QE period, even when G3 central bank balance sheets were growing at a much faster pace than now. And in the past few years, global equities have been buoyant even as the pace of G3 QE tailed off. “Liquidity” is not necessarily contracting. QE was the only game in town when interest rates hit zero and crisis-hit balance sheets in the private sector retrenched. Global financial conditions were under severe strain in 2008-2009. That’s no longer the case. Private sector credit growth is solid. “Liquidity” on this measure is not contracting. 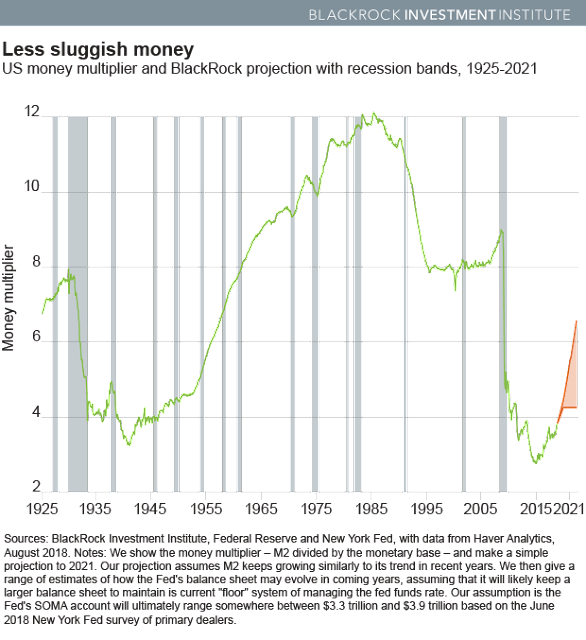 The U.S. money multiplier–the ratio of broad money (M2 or mainly short-term, cash-like deposits) to central bank base money (bank reserves and currency)–measures the rate at which the private sector is creating money per unit of the monetary base. 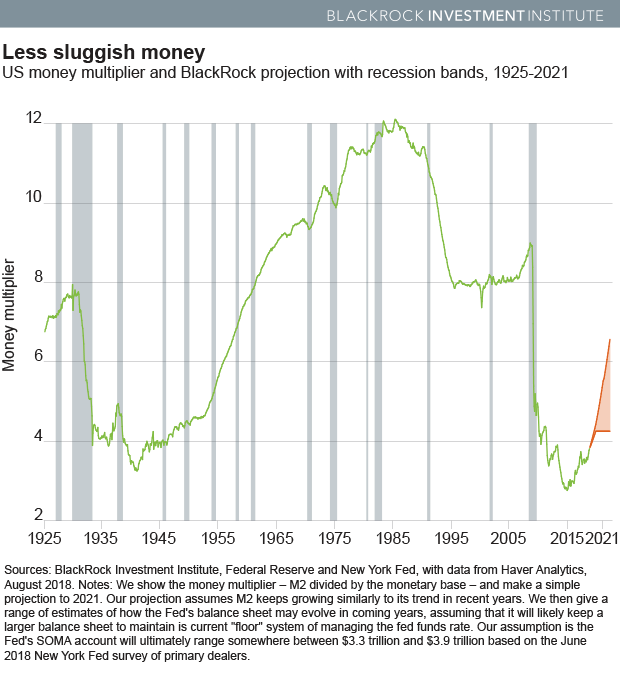 The money multiplier is accelerating, as the green line in the far right of the chart below shows, implying that broad money is increasing even as QT unfolds. A rebound in the money multiplier in a period of central bank balance sheet reduction was also evident in the eurozone (2012-2013) and Japan (2006). These episodes show how the sizable withdrawal of central bank liquidity can be managed without major side-effects. The QT narrative ignores the role of private sector credit. Bank lending – which totals about three times the Fed’s balance sheet – appears to have a much stronger relationship with the economic cycle than M2, peaking before recessions and bottoming out in the months following a recession. Lending is still well below previous cyclical peaks. Strong nominal U.S. growth, improved “animal spirits” (to use John Maynard Keynes’ famous phrase) and low interest rates are all supporting the private sector’s ability to create credit. We don’t expect QT, in and of itself, to disrupt this dynamic. The Fed stopping its balance sheet reduction sooner than many expect may relieve some QT fears. The Fed’s well-telegraphed and steady policy normalization has also limited QT’s impact–as would our expectation for the Fed to stop shrinking its balance sheet next year. We expect the Fed’s asset holdings to shrink from current levels near $4.3 trillion to between $3.3-3.9 trillion over the next year or so. Such a size would be about triple the Fed’s balance sheet before the emergency actions to ease financial market strains in 2008. The Fed stopping QT sooner than expected may alleviate some of the concerns tied to the QT story–namely that the Fed (and eventually other central banks) could make a policy mistake and mis-calibrate the impact of its balance sheet reduction on the economy and financial markets. What’s also clear in the chart above: The loose interaction between private sector money and the central bank’s influence over private credit creation has changed constantly over time. The Fed influences the backdrop in which private credit liquidity plays out–and animal spirits take over. This dynamic is not tied to the Fed’s own balance in any static fashion. We have come a long way from the global financial crisis: Banks are better capitalized, more tightly regulated and less leveraged. Importantly, risk appetite has recovered across the private sector. Modest Fed balance sheet reduction is likely to only partially offset the private credit expansion, in our view. Jean Boivin, PhD, is Global Head of Research for the BlackRock Investment Institute. He is a regular contributor to The BlackRock Blog.